When I was a little girl, I found out I was adopted about 5 years old. Although I am thankful for the truth, this moment would change my life forever. I always had a deep natural desire to find out the simple questions so many take for granted; who am I and where did I come from? If you were to ask me what it was like growing up adopted I would say it was like having an empty heart with a mind filled with sadness and despair. These feelings were hidden from the world because there was nowhere to share my pain. I felt isolated and alone. There were never-ending missing pieces to my story and it was impossible to feel whole without having the answers my heart desired. I was plagued with feelings of insecurities from being abandoned at birth. I had no voice and no choice resulting in disenfranchised grief, loss and trauma. At a young age all alone, I set out to find my birth parents searching for them everywhere I went. I was never going to give up in finding them. At the age of 21, I was given some information that was kept hidden from me. This was a dream come true for me because soon I would come face to face with my biological parents. I could make up for lost time, or so I thought. I had high hopes for the reunion I always dreamed of. When my birth mother loved me “So Much” why would I think otherwise? I don’t believe an adoptee can fully prepare for rejection from their biological parents. Soon I was faced with double rejection from both birth parents. I had nowhere to turn experiencing more grief, loss & sadness. I was in denial and I didn’t want to accept the truth. I discovered I was the product of an affair with a married man. My existence was a secret from everyone around. My biological father knew nothing about me. Every clue to my history was extremely valuable to me in my healing process. Every Birthday, Holidays, Mother’s Day & Father’s Day are constant reminders of the loss of 2 entire familirs, which has left me deeply saddened for many years No memories to remember, no good bye and no forever. The grief and loss were unbearable at times. The world didn’t understand this thing called “Adoption” that was glorified worldwide was the very source of my deepest pain. I started to research “Adoptee Support” and found nothing. This left me feeling hopeless, depressed and even suicidal at times. I began drinking alcohol at a very early age to numb my pain. I was in and out of drug and alcohol rehab, juvenile jail and many group homes. This would lead to unhealthy lifestyle habits as well as anger and rage issues. When I found both my birth parents they were both alcoholics. This scared me because of my history but finding this truth is what potentially saved my life. It prompted me to make the choice to make changes in my life. This is a choice only I could make, no one else could make it for me. I started a ministry called Celebrate Recovery and threw in the towel on my drinking habit. I’ve been living a sober life since August 13, 2012. During this time I have worked on healing by discovering my root issues come from abandonment & rejection from my adoption experience. Facing the pain head on is what I was focused on for the next 4 years. During this time I learned adoptees have no safe place to share their deep rooted feelings regarding being adopted. This is when How Does it Feel to be Adopted? was created for all the adoptees out there. 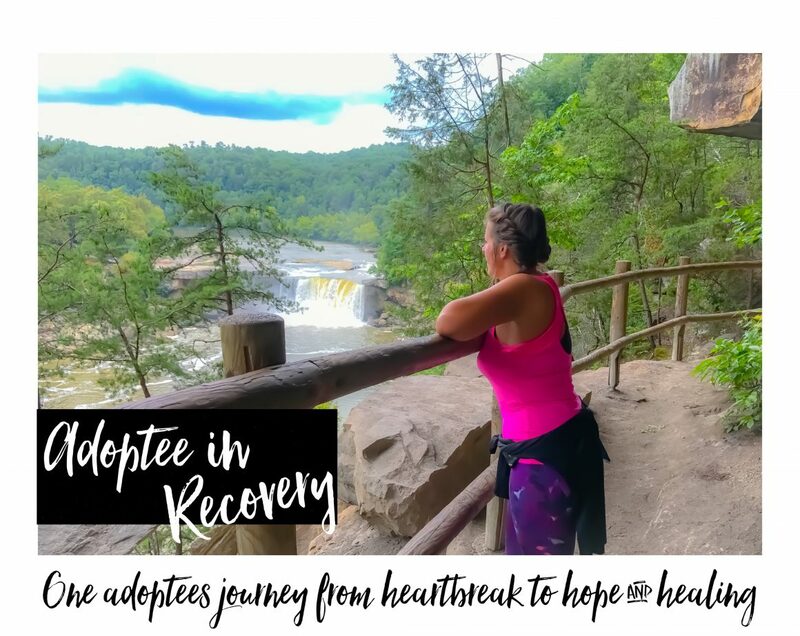 I started sharing my journey at Adoptee in Recovery which turned into a great healing through writing tool not only for me, but for other adoptees as well. I’m a firm believer in order to heal it we must feel it. I started to grow in my relationship with God and this is when things started to change for me. I gave my life to Christ in 2009 and in time my heart became filled with His love. This is love I never experienced before. God shining His light on me and learning the truth about my history has been my way to healing and freedom. I felt it was impossible to “give it to God” when I don’t have the truth to give. What am I giving? As I began to share my deepest hurts with God, he began to help me see things from another perspective. I grew in a way I never had before. I had a deep desire to reach out to other adoptees all over the world and hear their stories. I wanted to let them know they aren’t alone and the way the feel is normal for a not normal situation. I learned that adoptee attempt suicide at a rate that is 4xs more likely than non-adoptees, and prisons and treatment facilities are overflowing with adoptees. I knew because of these statistics and my own experience with attempting suicide as a teenager, battling addictions and suffering from abandonment & rejection I needed to share my story. My hope is to make a difference among the adoptee community. In sharing my journey I have adoptees from all over the world connecting with me and they begin to share their journey and feel validated. Sharing untold feelings & having someone who understands is healing. I let them know God loves them so much and “You can’t heal a wound by denying it’s there!” – Jeremiah 6:14 is another favorite verse I stand on for adoptees all over the world. I encourage them to share their stories and their feelings. I’m extremely thankful God helped me find my truth and he’s pushed me to help other adoptees do the same. It’s impossible to know where your headed if you don’t know where you come from. I’m a proud mom of 3 amazing kids and I strive to be a happy healthy mom because this is something I never had. I adore my career in private home health working with elderly. I attend Bethel Harvest Church in Lexington, KY and consider my church family to be the family I never had. I’m on a healing journey and live my life in recovery. This will last a lifetime. I rally for truth and for all adoptees to be able to access their original birth certificates which are only accessible in a few states. I assist with search and reunification for my fellow adoptees because everyone deserves to know where they come from. I’m working on starting an all adoptee support group in Lexington, KY.
We all deserve that safe place to share our deepest hurts. The best part is God heals. For any non-adoptees who are reading, please know that one of the main things you can do to help us is have the willingness to listen and learn. This is when our healing begins. Have the willingness to read adoptee stories and learn from us. No matter what the therapist say, no one knows how it feels to be adopted like we do. Our voices and views are the most valuable in the equation, yet the most ignored. I would like to share a word of encouragement for my fellow adoptees. God knows your hearts desires and he knows all your tears and pain. Never give up hope in finding your family and seeking your truth. I have some Adoptee Healing Tools I would like to share with you all. No matter what the truth is, it’s the way to healing, acceptance and freedom. It’s important to network with your fellow adoptees who understand what this journey is like. Please reach out to me. I would love to share your story at How Does it Feel to be Adopted? Please know you are not alone. You matter and your story matters. Read your post, could have been my own. No truer words ever spoken, as in everything in life, there can be nothing without a beginning. From our “beginnings”, commence our starting point, whereupon we “build” our entire lives. Many will argue, we are evolving, “changing” growing etc etc. This may be so, but can an Elephant evolve into a horse? or perhaps a mature Elephant. In reality , our world re-enforcers a myth that in some way we “own” our own children. No such thing, for babies are little people, they are already complete before they enter an existing world. Babies do not fall from the skies, they have genes, blood cells, memories of their time inside the womb, I could go on, but what has prompted me to respond is the scientific fact, no baby should ever be “taken” from their life giver, even if you support adoption (which I term identity theft), no separation of mother and child should ever be, in the stages of foundation. Mothers die, but an openness among their own gene pool can help a child to grow in strength and confidence as long as their mother is made well known to them. As in any “natural” Bereavement a child can openly grieve in an innate way for their mother, far too many babies grieving for their own mothers, are misdiagnosed, misunderstood, and learn all to quickly the art of delusion , long term open fostering, where no one wants to see a child suffering, but to be openly loved for whom they are, to be very aware of their own identity, gene pool heritage, culture and be very much cared for in pure unconditional love, just as so many reared by their life givers, can be allowed to become whom ever they were meant to be without added guilt of letting someone down, or not having to perform as a clone of their parents. I endure my life,I am surviving, I have never survived my first born son been taken from me. The hardest part for me is in the knowing that he has no concept of our truth, of how much he is loved, delusional societies, communities, religious orders, that sought to take my child away, did so purely because they had the power to do so. I have spent the best part of the last 30 years as an activist (first anonymous ,through fear) then openly through love of my son, in hoping more will come forward we all need to heal, so very much, for the wrongs done to the mothers, had compounded wrongs done to their children, sadly, even now today, there are people who believe “adoption” of thousands of babies was freely an informed choice. In dealing with real truths, we as a species can truly evolve but remain as humans. To anyone hurting, feeling rejected, abandoned, unwanted, please hear what I say, a young expectant Mum who brings an unborn child to full term who gives life even at the risk of her own, deep down like me always held on the belief “Someone will come, someone will stop this madness” no one came, no one cared enough, to say, let us help this mother so she in turn can continue to care for the child she has cared for the last nine months. In writing this it is not my intention to hurt anyone, but rather to help understand , what is nature, should never be mistook for what is nurture, yet when nature itself is nurtured only then can we begin to “mature” as humans.